One of the beauties of being a PADI professional is being subjected to a constant flow of new and fascinating people. Some will become lifelong friends, others relocate to the other side of the world. But distance is just a mere word these days as the glorious internet connects us all in seconds. While having a morning coffee and croissant on the south coast of England, I can catch up with what my old dive buddies and colleagues are getting up to thousands of miles away. It was during one of these moments of casual phone flicking that led to me to a date with a manta. Scrolling through the daily updates of current affairs and videos, I noticed one of my old colleagues from Ibiza was working in Nusa Lembongan, a small island just south of Bali. Any other day I might have scrolled on by without a second thought, but this day I took note as I’d recently booked a trip to the very same Indonesian island. 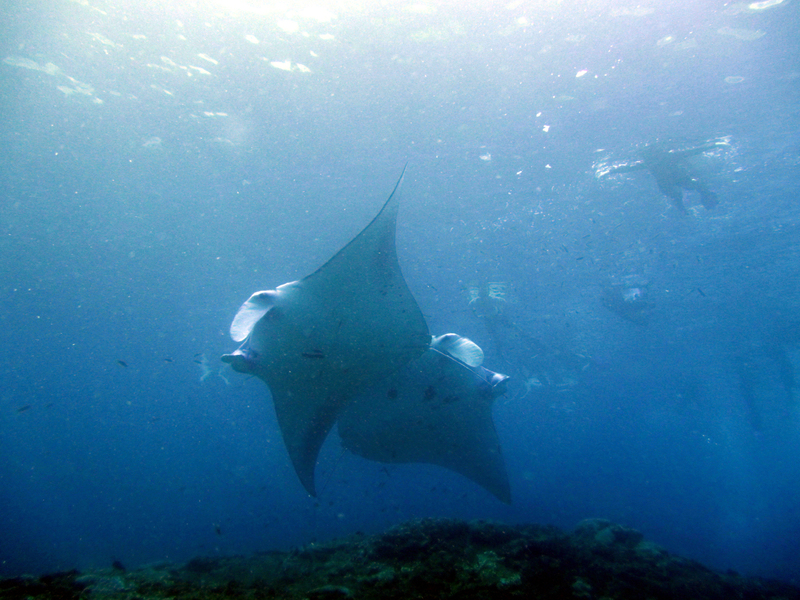 A few messages later, the itinerary was planned out and I was booked in to dive Manta Point on Nusa Penida. Cue excitement! Fast forward a few months and I was on my way to see my old friend. We had a catch up over a few Bintang’s the night before where she recounted many of her dive stories. Ultimately though, there was only one thing I wanted to know, what are the chances of seeing a manta? I was expecting her to say a 1 in 3 chance – a low figure to play down expectations and avoid dive day disappointment – but she went the other way, hyping it up with a 95% chance of seeing the majestic creatures. Cue excitement overload! Off we head towards Manta Point at 8am local time. It’s an early start for a holidaymaker, but the adrenaline wouldn’t allow for a lie in anyway. 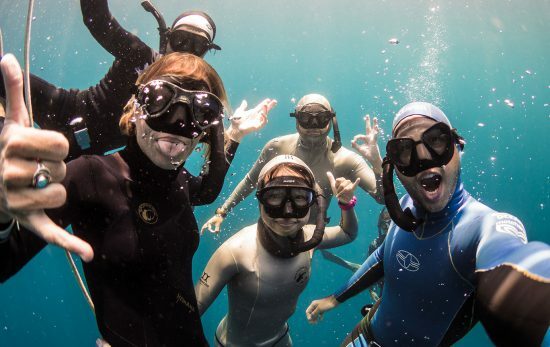 The dive crew and captain are loving life out there in Indonesia and their excitement is infectious. 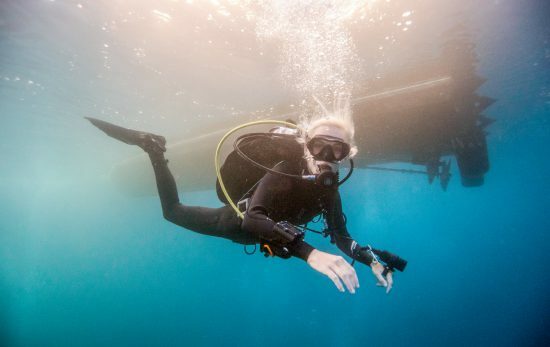 We arrive at the site and we’re given the briefing – depth, direction, time, procedures, dive teams, how to interact with the animals – we were ready to descend. I was expecting to be greeted by Manta’s left, right and centre. Unfortunately I was met with an uninspiring bottom and a couple of stingrays. 20 minutes pass and my friend gave me the underwater signal for “it’s gonna be one of those days”. My heart momentarily sank, but coming from the industry, I knew the score. We had to make the most of what we had in front of us. 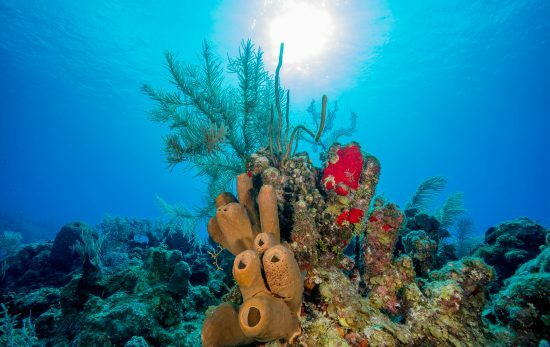 I started fixating on the smaller things, the nudibranchs and different species of fish living among the rocky reef. We were at 22m when we edged towards a drop-off that plummeted to about 32m. It was not in the dive plan to go beyond this point, so we turned back. And then, just as my friend turned 180 degrees, out of the blue came the unmistakable shadow of a manta! It swooped up and over the drop-off, glided right by me, and off it went. Assuming this was going to be the one and only interaction, I went into full paparazzi mode. I must’ve fired off about 50 shots safe in the knowledge that “one will come out alright”. The grace and beauty of this gentle giant is something I will never forget. We headed back towards the shallower water to a part of the dive site known as the “cleaning station”. We swam with a sense of pride and a certain air of accomplishment. I was sure we were the only ones from the dive boat to have seen a manta and I couldn’t wait to brag about it. Alas, it wasn’t to be. 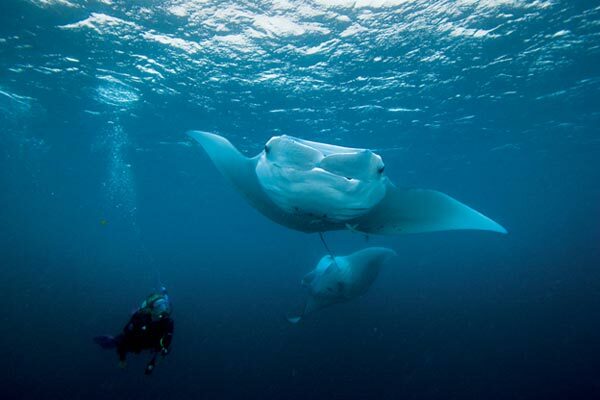 As we headed back, it seemed liked everywhere you looked there was a manta! 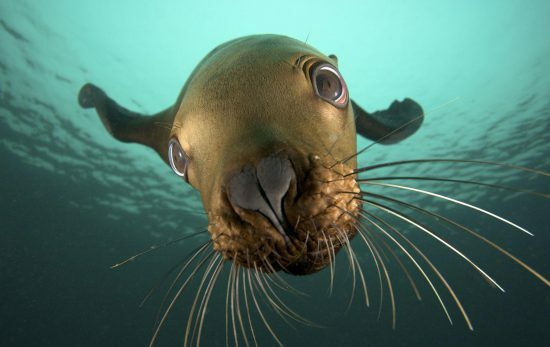 They were naturally inquisitive and they weren’t shy at getting close to the divers. These underwater gliders swooped effortlessly around us, at times only veering off at the last second. Like all good things, our dive had to come an end. We were getting low on air and this signalled an end to our time in their watery domain. 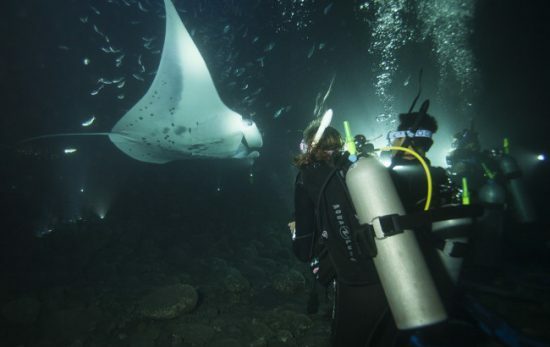 We surfaced with smiles as wide as the mantas wingspan and were filled with great satisfaction that we had one less thing to do on the bucket list.